Date Visited: Feb 22, 2012. For those who like waitresses with short skirts, heels, low cut and tight clothes, this is definitely the place to be! However, unlike most snobby hot waitresses, these ones are actually very polite and observant. The atmosphere and the decor of the restaurant are like any other typical modern restaurants, low ambiance and polished furnishing. The kitchen is separated by a clear glass, but don't expect too much as the kitchen is very small and the only thing you can see are line cooks grilling steaks. For dinner, we ordered 2 appetizers and 1 main dish to share. We chose the Houston's special - poutine and the crab cakes. Instead of the typical fries, their poutine uses wedges, which were quite crispy. However, their gravy was overly salty making the experience not very enjoyable. 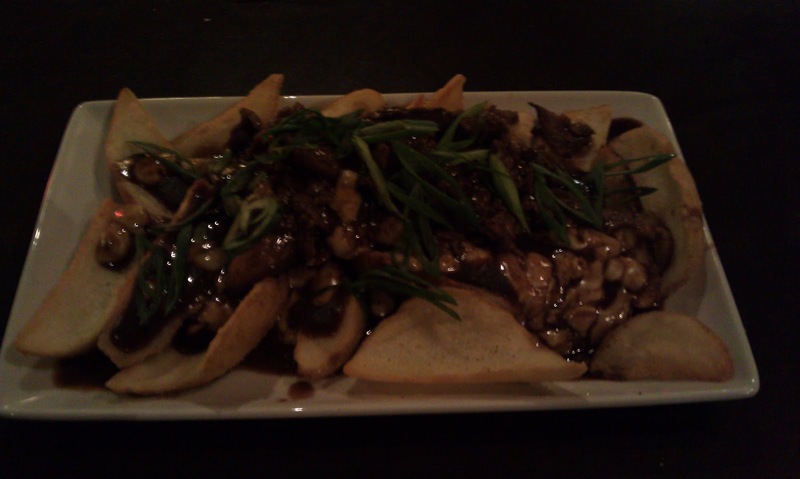 The poutine was also covered with thin slices of beef which had a great texture but definitely ruined by the gravy. 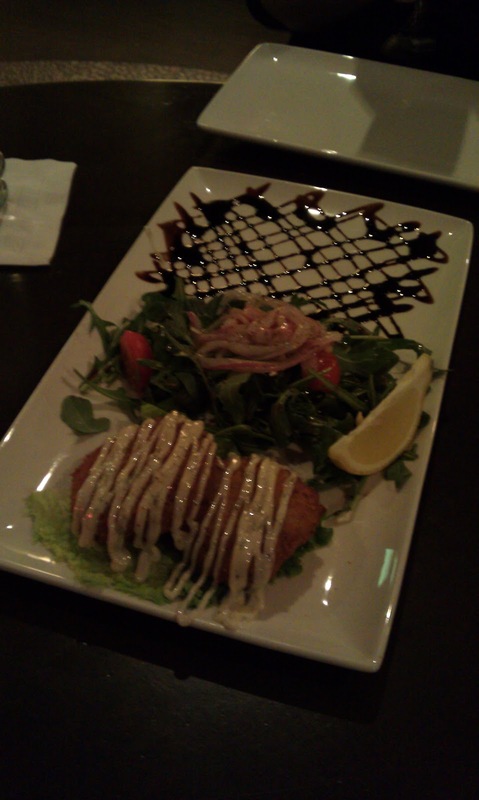 The crab cake was good, not amazing, but the salad was quite tasty with the aged balsamic vinegar which was very sweet and thick. The ribs were very small, probably because they were 'baby back ribs', and they weren't exactly the most "tender and fall-off-the-bone" style. We ordered a medium steak and got a well done steak. 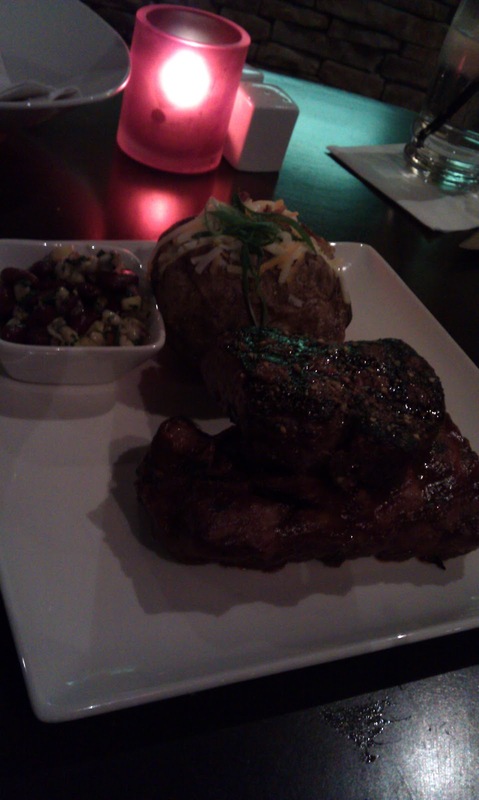 The waitress immediately replaced the steak with one that was indeed medium, and the steak was thick, juicy and tender. The dish also came with a salad that was a little weird (with corn, beans and mustard), and we've selected a fully-loaded baked potatoe as the side. The highlight of the whole meal was encountering some Toronto Raptor's basketball players who also dined at the restaurant (and no I don't know who they were but Ricky was very excited). Overall, the restaurant was decent and along the lines of The Keg, Joey's type of franchaise restaurants. Pros -- The beef on the poutine was tasty (quite tender and juicy) and the wedges were crispy. Cons -- a bit too much gravy/sauce (even tho i like sauce a lot) and it was too salty. The waitresses/servers were okay~pretty good in term of looking and services. Almost all the staff are female (with the exception of a guy in a suit? probably the owner/manager?) As for their dress code: short skirts + "low cut"s are typical/a "must" for most restaurant, so it is not a real "surprise". the "spacing" of the tables is more than sufficient and there are quite many booths. The overall experience is decent with no surprises. I am not sure whether i will "re-visit" that restaurant in the future. I will recommend to those who are willing to take the chance to meet up some Raptors' players.